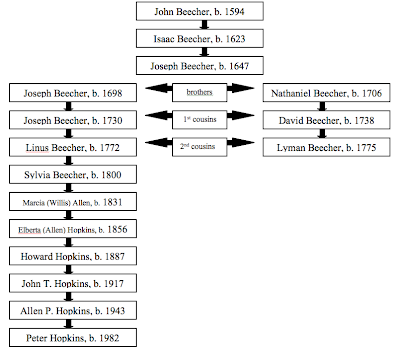 While working on Pete's family tree, I found a fun family history fact: Pete is the second cousin (seven times removed) of Lyman Beecher, which, I think, makes him the third cousin of Harriet Beecher Stowe. 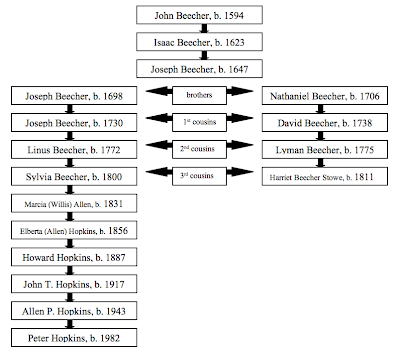 I'm not a genealogy expert, so please let me know if I've gotten the terminology wrong here. In any event, Pete can now trace one strand of his family back to the Great Migration and a specific location in England (Kent), so that's exciting. Also, his ancestors inspired mobs to burn down convents. Update (1/18/09): Ok, another big "duh" moment for me. I've been going around telling people my husband is a second cousin of Lyman Beecher and have been sort of surprised that most people are underwhelmed by this news. I couldn't figure it out until I realized that "Lyman Beecher" probably meant nothing to my in-laws or their friends. When I started saying "third cousin of Harriet Beecher Stowe" instead, I got much better reactions. Thus, I am adding an updated diagram that includes Mrs. Stowe and am laughing at myself for not thinking of adding her in the first place. Today is the day when Christians the world over celebrate the birth of Jesus. I may not be a Christian, but I have nothing against presents and cookies, so I'll be spending the holiday with family. Although Jesus is currently the 77th most popular boys' name in America, it is practically absent from the US Census before the 1850 census (there are hundreds of Americans named Jesus after the inclusion of the Southwestern territories and California). On the other hand, Herod was not an unheard of name during the first half century after the establishment of the republic. 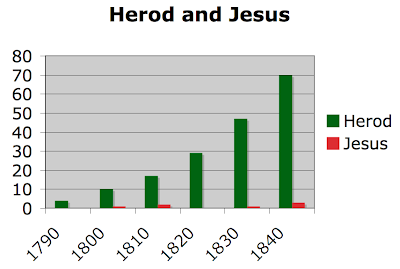 Some of the Herods have nice, Christmas-y names, including Herod Stocking of Monroe, Illinois and Herod Christian of Stock, Ohio. So, Merry Christmas to those who celebrate, and a special hello to all the Herods out there. The latest addition to my ongoing collection of furry (and feathered) graveyard friends is this common Eastern Gray Squirrel. There's nothing really special about coming across these little fuzzballs in Harvard Square — in fact, you can hardly walk across Harvard Yard without having one run across your path. Still, they're cute and roly-poly this time of year, and I don't often see one perched on a gravestone. The usual arguing over the tree was cut short this year due to the weather. When there's a foot of snow, no one really feels like examining each and every tree on the farm. Also, even the mediocre trees look great in the snow, so it's a bit difficult to make an informed decision. It snowed steadily the whole time we were out at the farm, which led to lots of snowball fighting and wrestling, but very little actual examination of trees. We found one in the end and I'm sure it will be just fine. 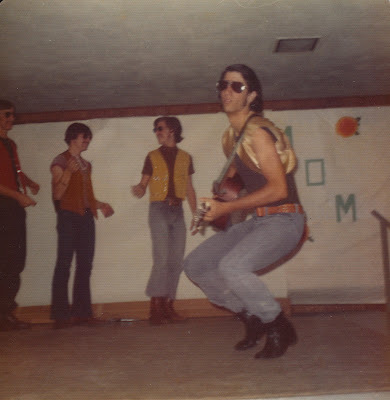 The first of my two guest posts is up at Executed Today! For in this we groan, earnestly desiring to be clothed upon with our house which is from heaven . . .
An early winter afternoon is the perfect time to photograph 80% of the gravestones in the old Harvard Square graveyard. Unfortunately, the Edmund Angier stone is among the other 20%. Oh well — I hope you can read this text and I'll try to get a better pic in the spring. The blogosphere is abuzz with the tale of little Adolf Hitler Campbell and his birthday cake woes. Many commenters are appalled that a family would name their children Adolph Hitler Campbell, JoyceLynn Aryan Nation Campbell, and Honszlynn Hinler Jeannie Campbell [Note: Did they mean "Himmler"?]. Of course, in these great United States, you are perfectly free to name your child anything you like, and other people are perfectly free to call you a fool for doing so. Maybe not exactly what Madison had in mind, but something similar. When the 1940 census is released in 2010, I imagine we'll find many little boys named Adolph Hitler. There aren't any in the 1930 census because Hitler was not as popular in America in the 1920s as he was in the 1930s, but I'd be surprised if there are fewer than 20 in the 1940 census. Has anyone written a cultural history of messages written on paper currency by ordinary citizens? I have a dollar bill in my wallet now that says, "Impeach Bush." This one says, "Free the Werewolves." And there's always Where's George? If someone were to write that book, I would read it. 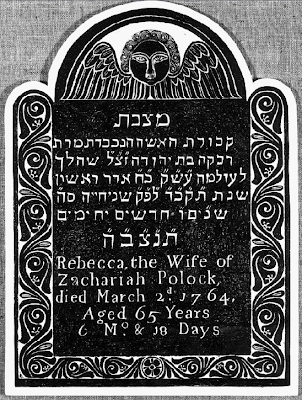 It strikes me that this particular gravestone is a microcosm of Atlantic history: Puritan iconography dedicated to the memory of a black slave owned by a Portuguese Jew who made his fortune selling spermaceti and whale oil in the West Indies. Add in the language of economic and emotional loss, the artisan workshop tradition, and fact that Peter died by drowning in the Atlantic (ok, technically Newport Harbor), and it starts looking like an ideal object for introducing a larger work on the material culture of death in the Atlantic world. Like, perhaps, my dissertation? In the very likely event that Jeffrey Goldberg does not read my unsolicited email, I would like to go on the record as saying that the Christmas carol known as "I Heard the Bells on Christmas Day" was written by Henry Wadsworth Longfellow, and not, as Goldberg states, by Johnny Marks. This carol is often said to be "based on" Longfellow's poem, but that's pretty weak. If I could get credit for "adapting" poems merely by deleting two stanzas and changing the title, I'd get a lot more author credits. Update: Hey, how about that! Thanks for reading my email, Mr. Goldberg! Now I can sleep easy. Emily Yoffe at Slate writes about her stint as an historical interpreter at an 18th-century farm in the most recent edition of "Human Guinea Pig." In general, reenactors, living historians, and first-person interpreters are portrayed as crazy people, so it's nice to read a sympathetic, even celebratory, depiction. While I haven't done much active reenacting lately, I grew up in a reenacting family that eventually went over toward the "living history" side of the spectrum. Like Ms. Yoffe, I find stays rather comforting. Posting will be intermittent over the next few weeks as I am currently caught in the holiday/end-of-semester vortex and must direct every impulse to write toward strictly productive ends. As you can see, in the earliest of the three periods, gravestones for white adults were similar in size, while enslaved adults' stones were about the same size as white children's. 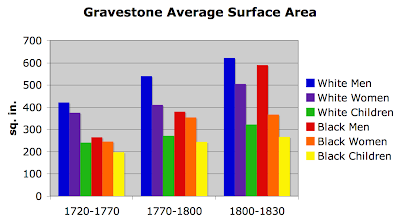 In the middle period, African American adults have slightly larger headstones than before, though that may be due to the practice of averaging larger stones for free people with smaller stones erected for slaves. By the final period, black men's gravestones are almost as large as white men's and the ratio of men:women:children is similar among both blacks and whites. The one piece of data that is still a bit puzzling to me is the lack of growth in black women's stones between the second and the third period. Gravestones increased in size for all groups, but black women saw the least growth (3%) while black men saw the most (36%). I think this probably has to do with the activities of the Free African Union Society, a mostly male organization which sponsored funerals (and perhaps gravestones) for its members. My main question about this data: What can gravestones tell us about how men and women in Newport might have experienced/expressed/understood freedom differently? I recently came across a Flickr group dedicated to photos of graveyards and cemeteries, and promptly joined it. Most of the pictures are from 19th- and 20th-century cemeteries, but I've enjoyed going through the various threads, particularly the one named "Graves That Make You Giggle." Over Thanksgiving, I brought my younger sister, Brighid, to the graveyard in Mansfield Center, CT. 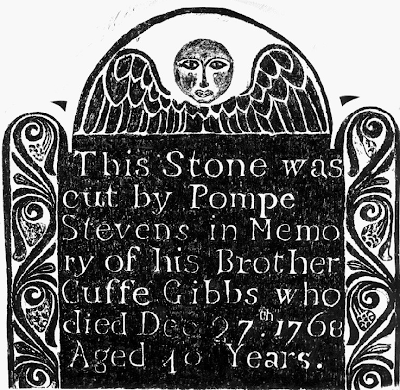 I was quite taken with the Bridget Snow stone (1768), though my sister was less enthusiastic, perhaps on account of the similarity in names and the graphic image. "How Easy It Would Be to Hurt Your Poor Little Body!" If you thought the Pepperell vital records were alarming, you might want to skip these excerpts from Favell Lee Mortimer's immensely popular Peep of Day series (1836). The Peep of Day (or A Series of the Earliest Religious Instruction the Infant Mind is Capable of Receiving) was a bestseller many times over in both Britain and America. Although Mortimer's grand-niece famously called it "one of the most outspokenly sadistic children's books ever written," millions of 19th-century children learned their first lessons about God from Mrs. Mortimer's stories. God does every thing. God gave you this little body, and he makes it live, and move, and breathe . . . God has covered your bones with flesh. Your flesh is soft and warm. In your flesh there is blood. God has put skin outside, and it covers your flesh and blood like a coat. Now all these things, the bones, and flesh, and blood, and skin, are called your body. How kind of God it was to give you a body! I hope that your body will not get hurt. Will your bones break? Yes, they would if you were to fall down from a high place, or if a cart were to go over them. If you were to be very sick, your flesh would waste away, and you would have scarcely any thing left but skin and bones. Did you ever see a child who had been sick a very long while? I have seen a sick baby. It had not round cheeks like yours, and a fat arm like this. The baby's flesh was almost gone, and its little bones were only covered with skin. God has kept you strong and well. How easy it would be to hurt your poor little body! If it were to fall into the fire it would be burned up. If hot water were thrown upon it, it would be scalded. If it were to fall into deep water, and not be taken out very soon, it would be drowned. If a great knife were run through your body, the blood would come out. If a great box were to fall on your head, your head would be crushed. If you were to fall out of the window, your neck would be broken. If you were not to eat some food for a few days, your little body would be very sick, your breath would stop, and you would grow cold, and you would soon be dead. You see that you have a very weak little body. Your mother has sent you to this nice school, and she gives you supper when you go home. I know she will be kind to you as long as she lives. But remember who gave you this mother. God sent you a dear mother, instead of putting you in the fields, where no one would have seen you or taken care of you. The following chapter contains a long list of ways in which the reader's father might die suddenly, including falling off a ladder and getting kicked by a horse. I won't go through chapter by chapter — the rest of the book is mostly a life of Jesus with a few other Bible stories and a hair-raising account of the Apocalypse. If you're interested in more from Mrs. Mortimer, I highly recommend Todd Pruzan's The Clumsiest People in Europe: Mrs. Mortimer's Bad-Tempered Guide to the Victorian World (2005), which reprints some of her geography lessons with commentary. Hilarious excerpts here. I've always heard that Copp's Hill in Boston was named for William Copp (d. 1670) the shoemaker who once owned the land. 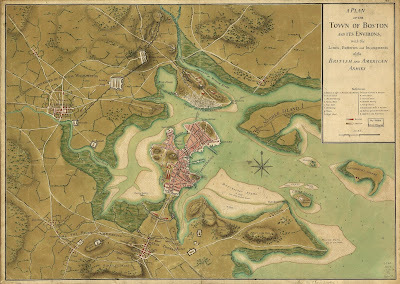 The other day, I was looking at a wall-size reproduction of a 1776 map and noticed that the area was labeled as "Corpse Hill." So which is it? Was the area named for William Copp or for the burying ground (est. c. 1660)? Did the mapmaker hear "Copp" and figure that Bostonions had just omitted the "r" in "corpse" (a logical deduction if he knew of the graveyard)? Is it a clever play on words? Musings on the confusion can be found here, here, and here. While attempting to authenticate the gravestones depicted on a series of postcards marketed as "The Tragedies of Pepperell, Massachusetts," I came across a transcription of the Pepperell Vital Records from the 19th century. The most common causes of death among Pepperell residents were consumption, dropsy, dysentery, stillbirth, canker, mortification, and unspecified fever. Many are listed as dying in the army, either as the result of wounds or of disease. I learned a few new words, including "quincy," an eighteenth-century term for tonsilitis (vocab lesson here). Quite a few Pepperell residents died of "old age," which is pretty remarkable when you consider how many were drowned in wells, run over by carts, and crushed by mill stones. Below, I have reproduced some of the more horrifying entries. Though certain of my professors would scold me for doing so, I cannot help but imagine an elaborate story behind each of these laconic records. Did a terrified older sister desperately try to save poor little William Emerson only to have him expire before their parents returned? How could Abigail Blood have died of scurvy, not in the dead of winter, but in July, when fresh vegetables should have been easy to find? What did people whisper when Josiah and Mary Nutting walked past? And what on earth happened to Henry Shattuck? BLOOD, Abigail, w. Nehemiah, scurvey, July 3, 1798, a. 42 y. BLOOD, Abigail (Nabby) injury in a cida mill. Oct. 10, 1833, a. 42 y. BLOOD, Jonathan, s. David & Abigail, killed by a cart wheel at Concord, July 19, 1763, a. 21 y. BLOOD, Moses, strangling, Apr. 30, 1838, a. 88 y. BLOOD, Volney, found dead in the road in Groton, a. 13, supposed to be in consequence of injury in falling from a cart, Nov. 26, 1833. 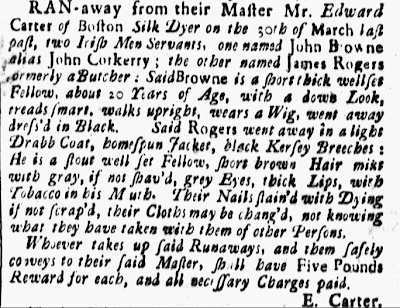 BOWERS, Aaron, s. John & Lydia, killed by the fall of a stack of boards, Sept. 12, 1791, a. 2 y. 10 m.
BOYNTON, Abel, S. Abijah & Sarah, lockjaw. Dec. 21, 1798, a. 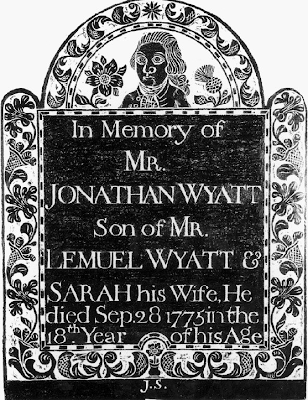 22¾ y.
BOYNTON, Sarah, w. Capt. Joseph, strangled, Aug. 17, 1787, a. 47 y.
ELIOT, J.K., drowned while bathing in the Nashua, a. 17 y.
EMERSON, William, a ch. Rev. Joseph, d. at Reading, while parents were on a visit, Oct. 17, 1753, a. 4 m. 7 d.
FISK, Susan, found dead Dec. 2, 1820, a. 76 y., supposed to have died Nov. 15th. FITCH, Jonas, fell in little brook, stunned, wounded & drowned. May 31, 1808, a. 67 y.
FITCH, Luther, s. Jonas, fever & worms, Nov. 11, 1819, a. 3 y. GREEN, John Brooks, s. Jonathan, by scalding, Mar. 15, 1831, a. 8 y. 4 m.
HARRIS, Joseph, delirium tremors, Nov. 14, 1841, a. 37 y.
HOSLEY, Elizabeth, wid., bleeding from the stomach, Oct. 27, 1806, a. 86 y.
JEWETT, Sarah Green, wid. Nehemiah, Sept. 26, 1829, she fainted and fell into the fire, a. 90 y.
LAWRENCE, Lydia, a short time resident in town, killed by lightening in the house of Joseph Stevens, jr., July __, 1825, a. 36 y.
PARKER, Abijah, a pecular sore on the thigh, Dec. 4, 1811, a. 66 y.
PETERS, Joseph, found dead in Jonas Wright's san pit, Nov. 10, 1774, a. 25 y.
RICHARDSON, Abiel, h. Sarah, killed by a fall, assisting at Dunstable raising of meeting house, July 19, 1753, a. abt. 30 y.
SHATTUCK, Hannah, wid., insanity, Apr. 20, 1830, a. 69 y.
SHATTUCK, Henry, s. Emerson & h. Azubah Bowers, suicide at Westminster, remains were found Nov. 3, 1827 & buried, he d. in Dec. 1826. SHATTUCK, Jackson, cancerous disease of the face, Oct. 9, 1840, a. 40 y.
SHATTUCK, John, hanging, Dec. 15, 1785, a. 74 y. 6m. 12 d.
TENNEY, Catharine W., incubus, Jan. 22, 1837, a. 8 y.
VARNUM, William, s. John & Eunice, killed from stroke of his sythe, Aug. 9, 1820, a. 19 y. 4 m.
WHITE, Sarah, wid. Patrick, generally thot by hydrophobia, Apr. 3, 1810, a. 77 y.
WRIGHT, Edward, a foreigner at the poor house, suicide, Oct. 18, 1834, a. 55 y.
I'm not sure who carved the specifics on the front — perhaps one of Manning's sons or apprentices. Josiah Manning also carved a stone for his wife, Mary, who died in 1796. Unlike Manning's own stone, Mary's stone is stylistically distinct from the bulk of Manning's work. The wings are feathered and point downward instead of the distinctive bat-like wings of other Manning stones. The face is different as well — it lacks the on-end hair and surprised eyes common on other Manning stones. It seems that Josiah may have been attempting to carve a portrait of his beloved wife. This is a mash-up of Job 1:21, Psalm 88:18, and an epitaph found all over New England ("In ye Cold mansions . . ."). While researching this Pompey Stevens paper, I have come across many quotidian tragedies that may not make it into the final paper. That's why I run this blog — so I can keep track of the stories I find in the archives and graveyards. This Newport gravestone tells a doubly tragic tale. First, Peter, a boy enslaved by Aaron Lopez, drowned after falling out of a boat near Lopez' wharf. Second, his epitaph characterizes his death as a financial, as well as a familial loss. His epitaph is a testament to the violence and tragedy of a system that took children from their parents for the financial gain of others. Daugher of ye Revd Mr. Eleazer & Mrs.
Novemr. 1749 in ye 27[?] Year of her Age. The raised head, turkey-feather fan, pinwheels, and central heart all point to this as the work of Benjamin Collins. Collins, a student of Obadiah Wheeler, replicated his teacher's discursive epitaph style. 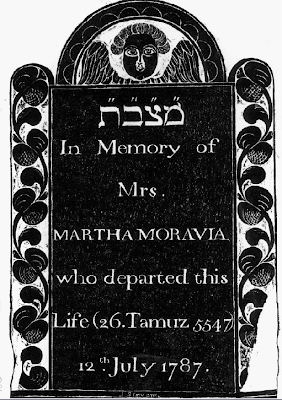 This epitaph shows up several times in my preliminary Google searches, but I haven't yet found an example earlier than 1742. I imagine it comes from a published source because it crops up in England, South Carolina, and Boston. The one that keeps popping up is William Harvey (1756), but unless Edward Carter's stone is backdated, it is still the earliest I can find. There are a few undated examples, but no solid leads yet. 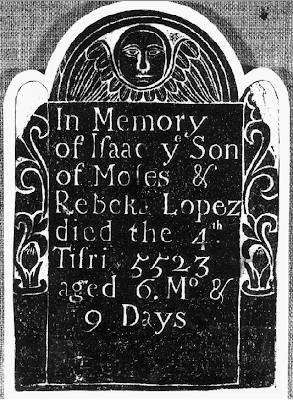 Variant forms of this epitaph are often associated with suicides, dating back to the Mungo Campbell case (1770). I don't mean to suggest that Mr. Carter killed himself — I'm just making an observation. NOVr 11th 1742 AGED 45. 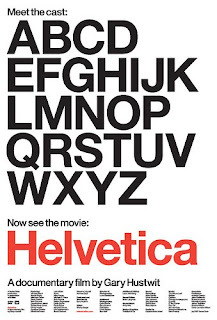 Last night, Pete and I watched Helvetica (2007), the documentary about the typeface. Unfortunately, I did not like it nearly as much as I thought I would. Pete and I are the type of people who should have enjoyed this film. Neither of us is a graphic designer, but he is a software engineer with a particular interest in user interface, while I have spent the last week analyzing the lettering on a series of Newport gravestones in an effort to attribute them to individual carvers. We were primed to like this movie. 1) Lack of historical context: The whole point is that Helvetica was introduced in the 1960s by modernists who wanted to replace the messy, subjective, nostalgic typefaces of the 1950s with something clean, crisp, neutral, and universal. Except for a brief (and wonderful!) segment on which a graphic designer flips through a magazine from the '50s to show some before and after ads, the film provides no examples of the "before" that Helvetica was meant to correct. I would have liked a bit more background — how did typefaces change over the course of the early 20th century or even *gasp* the 19th century? Not a whole long segment, just a 3-minute montage to place Helvetica in its historical context. 2) Lack of specific context: Who are these people being interviewed? Yes, I see that this one is the son of the original designer and this one is a modernist designer who helped make Helvetica ubiquitous. But what about random youngish designer #1? Why do I care about him? And random youngish designer #6? Isn't he just repeating what random youngish designers #2-5 have already said? Who is he anyway? Well, they displayed his name (in Helvetica), so I guess that's all the information I need. 3) Lazy filmmaking: For an hour and a half, the film follows this format: rambling interview, montage of Helvetica visible in a street scene, rambling interview, montage of Helvetica visible in a street scene, rambling interview, montage of Helvetica visible in a street scene, etc. etc. Repeat. For a film about graphic design, the filmmakers could have used more technology than a single camera, aimed alternately at a speaker and a street scene. Where was the cool graphic interlude showing us why Helvetica's proportions are so lovely? Where was the "here's this poster in five different fonts — see how they convey such different messages" scene? About a dozen people assert that a typeface can convey a message, but until the segment with the 1970s "postmodernists" about 3/4 of the way through, they were just telling, not showing. In the end, the way this film was Helvetica translated into movie form. It was crisp, clean, and uncluttered. This philosophy actually exposed the central fallacy of Helvetica, which is the belief that text can be transparent, neutral, and universal. As it turns out, without context, it's all just dull and unimportant. Here's another interesting stone from Plymouth, MA. Most of the work — the lettering and the stars — was done by the same carver who was responsible for those strange, possibly machine-made urns. The central design is wholly different. The hand-carved ship and waves are lovely and the angel, while slightly awkward, is nice in an American primitive sort of way. I'm sure I've seen something similar painted on a wooden shingle or stitched on a pillow in the Old Sturbridge Village gift shop. The image of an angel watching over a ship isn't exactly subtle, but it is poignant in a graveyard crowded with cenotaphs dedicated to men who died at sea.